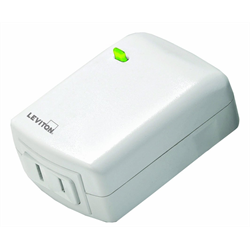 The Leviton Decora Smart WiFi plug-in dimmer lets you automate, control and schedule plug-in dimmable lights with no automation hub required. Set-up is simple, just plug-in and enroll the device in the free iOs or Android app. This universal plug-in dimmer supports incandescent, dimmable LED, CFL. It's designed to support even very small sensitive loads like holiday lights or a single LED bulb, so bulbs will not glow when turned off. Once enrolled you can use your smart phone to check status, turn lights on, off, brighten and dim them from anywhere in the home or around the world! Easy set up, control and scheduling. No automation Hub Required.